Every day, people all over the United States drop into panaderías, liquor stores, and pharmacies to place a call on a familiar red phone. They know that someone on the other end can answer them in their language and simplify a money transfer. The transfer could be for something as pleasant as a birthday gift or as urgent as a medical bill payment. The remittances industry in Latin America is a $50 billion-a-year business, and approximately half of that goes to Mexico, says Enrique Carvajal of Sigue Corporation, a leading global money transfer company. The majority of the time, money is transferred to loved ones out of necessity. Sigue’s primary business is in Latin America, but the company decided to go global about three years ago. As global vice president of human resources, Carvajal’s role is to work with the senior management team and the CEO to drive the business and maintain the balance between the strategic needs of the company and the happiness of employees across the globe. Along with having a successful career, Carvajal has always wanted to help his community. After spending 18 years at Warner Bros. Entertainment, when a job opportunity presented itself at Sigue, Carvajal says there was no doubt he wanted to take it. “I was immediately attracted to the company and to its mission,” he says of Sigue’s dedication to providing people with a safe and reliable method for sending money to their families and friends. The red phone has come to symbolize not just the Sigue brand, but also a commitment. From the day he started at Sigue in 2011, Carvajal explains that the one set of marching orders he had was to ensure that the company’s values (integrity, passion, service, teamwork, excellence, and competitiveness) were instilled all over the world. He made sure that employees and clients were treated as family. “I couldn’t ask for a better mission,” he says. He also points out the importance of having a system that works well when customers find themselves in difficult situations. “We’ve had major disasters in Mexico, and have been able to help people needing to urgently send money home to their families. We’ve [helped] people whose parents get sick or have passed away. They come to our branches, sometimes in tears, and need to make sure that they can get money back home quickly,” he says. 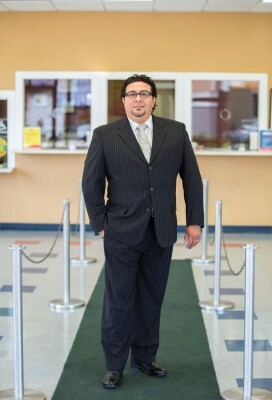 Carvajal’s devotion to helping his community does not end with his current role. He’s also exploring a partnership between Sigue and Soledad Enrichment Action, a Californian nonprofit organization specializing in high school educational services. The idea is to start a mentorship program to help struggling high school kids from the San Fernando Valley, where the graduation rate is only about 40 percent. “They are mainly Latino kids, and I want to show them that they are capable of so much more,” Carvajal explains.